Five years ago, when I was still on my first trimester with Akisha, we had the chance to visit Albay and explore some of the key places in Legazpi and Misibis. Back then, the structure at Lignon Hill was still under construction and there was no Embacardero de Legazpi yet. On our second visit to Albay, we decided to have a tour of the city again to check out what had changed in the previous years. From the airport, a representative from Misibis Bay Resort and Casino greeted us and led us to a private van which would bring us around the city. Jomel, our tour guide gave us a brief background about the city if Legazpi and our itinerary for that morning. Our first stop was Lignon Hill. Much had change since we went here in 2008. There's a concrete structure where souvenir shops and cafes are housed. The view deck had improved. It is nice to have picnics at Lignon Hill, or even chill out at night. But make sure you have a car with you as there are no public transportation going up the hill regularly. From Lignon Hill's view deck, you can see a panaoramic 360-degree view of Albay. 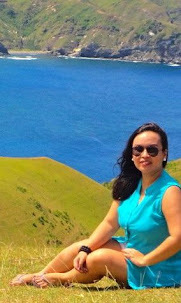 The majestic Mayon volcano, the islands of Cagraray, Batan, Agutaya and Rapu-Rapu, the Legazpi airport and a lot more. Unfortunately, it was gloomy when we were at Lignon Hill, so our dear Mt. Mayon did not show up again. Oh well, maybe next time. This was my second time to go here and yet, no perfect cone photo still! When we went back to the van, I couldn't help but notice this - a big bottle of Evian water spray for the guests. Sosyal! Our next stop was the Cagsawa Ruins. On our way, we passed by these ATVs and a bridge over huge volcanic rocks lining a river. The guide said it was one of the places severely damaged by the typhoon Reming in 2006. You can go on ATV tour of the Mayon lava front which is approximtely 18 kilometers. This activity though, is not for the faint of heart. Halfway down the hill, we saw this hanging bridge. We could have tried to cross this but its raining and the guide said it was slippery and dangerous at this point. :Lignon Hill is about 10 minutes away from our next stop: Cagsawa Ruins. If you wish to commute, just take a jeepney bound to Camalig from Legazpi City. It will bring you to the entrance of the park. Cagsawa Church was built in the Spanish time and was devastated by the worst Mayon eruption in 1814. To date, only the belfry remains at the site, more popularly known as the "ruins" or "Cagsawa Ruins". There were a couple of photographers who would offer to take trick shots of you against the ruins and the volcano but we did not avail of this anymore as we just wanted to explore the park and learn about its history. Our guide was so knowledgeable that he told us more stories about Cagsawa Ruins. We saw this ABS-CBN's Balitandaan marker in one corner of the Cagsawa Ruins Park. Outside the park are souvenir shops where you can buy crafts made of abaca as well as some local delicacies. If you are not staying in the city and don't have the chance to go to the abaca stores there, I suggest you buy your stuff here. The prices are almost the same. I also suggest that you buy your pili nuts here instead of at the Albay Pili Nut Factory where the prices there tend to be higher. For me, the best pasalubong to bring home from Cagsawa Ruins, or from Bicol for that matter, is fresh pili nuts. This was the first time I tried raw, as well as toasted pili nuts and I couldn't help but compare it to macadamia with its nutty flavor even better and more moist than almonds. Fresh pili nuts cost around Php 280 per kilo. The lady said you can toast/roast it on a pan or in the oven and remove the skin. However, she also said that the skin is actually rich in fiber, and I kinda like it with skin on so I ate it anyway. I like the fresh ones over the candied ones. After shopping for souvenirs at Cagsawa ruins, we hopped on our van again and headed to another historic landmark in Albay, the Daraga church. Nestled atop a hill, Daraga church (also known as the Church of Nuestra Señora de la Porteria; Our Lady of the Gate Church) was built in 1773 by the Franciscan missionaries. Its architecture is a melange of Gothic, Renaissance and Mexican Baroque, bringing a unique style far from many colonial churches in the Philippines. The facade is made of volcanic rocks. Our guide even said that people were asked to bring eggs to help in the construction of this church. Egg whites were used as adhesives back in the day. You might notice that the belfry has a different color than the front of the church. This is due to some restoration including lime-washing which they did recently. If you are planning to commute, take a jeep with the route Daraga-Legazpi and ask the driver to drop you off at the municipal hall. the stairs (a bit steep) going up the hill is just beside. You will also see Jollibee and NOVO Jeans nearby. Our next stop was the Albay Pili Nut Factory. It is a small store where you can buy pili nuts of all sorts. Their bestseller is the Mazapan de Pili, a chewy bar made of sugar and pili bits. It's kinda pricey though so I did not get one. I'm happy with my fresh pili nuts. I just hope they would show how they do these pili products like at the cashew nut factory in Coron. It would be more interesting than just selling the finished products to tourists. Our last stop before going to Misibis Bay Resort and Casino was the home of sili (chili) ice cream - 1st Colonial Grill Express). This was not part of our original itinerary but we insisted that we would like to try this famous dessert, so our guide gave in. 1st Colonial Grill is a hip cafe that serves coffee concoctions, pastries and other snacks, usually with a Bicolano twist. The place is cozy and there's free WiFi so we didn't mind waiting for our ice cream. A regular serving of their homemade ice creams costs around Php 79, but for those who would just like to sample the famous chili-infused ice cream, you can avail of a scoop at Php 27. Aside from sili, we also ordered pili ice cream. True to its name, it's hot! Hubby said it tastes like sweetened pimiento. I like how it mixes the hot, spicy flavor of chili to the rich and creamy vanilla ice cream. If you had tried wasabi ice cream, this one is close. On the other hand, their pili ice cream is divine! Its nutty flavor is just perfect. If you love Arce Dairy's pistachio ice cream, this one has the same effect of nuts and cream. On our way to Misibis Bay Resort and Casino, which is about 45 minutes to an hour drive from Legazpi, our guide pointed at this monument in Brgy. Padang. he said that this barangay was devastated by the typhoon Reming in 2006 and was erased on the Albay map. A lot of families died here. So, on our way back to Legazpi on our last day, I asked the driver to pull over at this monument for us to say a little prayer.